Being one of the closest pubs to the SCG has its perks. You’re guaranteed a rush of patrons after the game; those patrons will probably want beer; and following too many plastic-wrapped meat pies they’ll probably want food too. But that also means that you end up catering to a raucous, bawdy crowd that scares off locals just seeking a quiet drink. 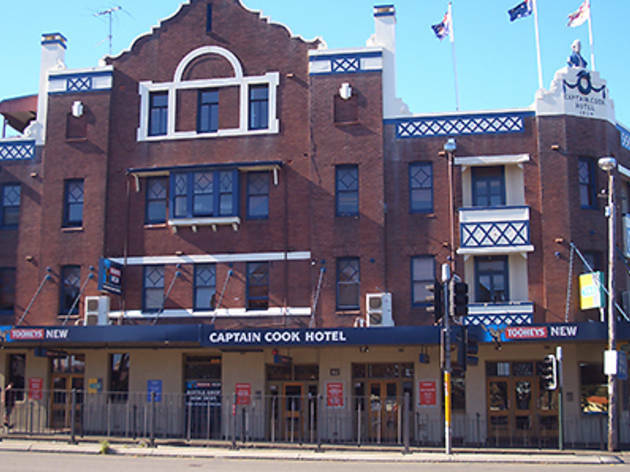 But the Captain Cook Hotel is more than just a footy pub. They’ve put the finishing touches on recent renovations and suddenly there’s craft beer on tap, gigs in the band room and an outdoor courtyard under the shade of two fig trees – complete with white picket fence. Tucked in behind the building it’s a sheltered, quiet spot for a drink or some house-made fish fingers in the cool night air. Just inside the doors is a simple, black tiled bistro with a pool table to keep hungry hands occupied. It’s a familiar mix of curry, burgers, fish and chips and steak on the menu here. They also have $16 lamb shanks where you get two tender shanks with gravy on a mountain of mash. In the middle of the pub is a rock’n’roll saloon with timber booths, barrel tables and a low stage. 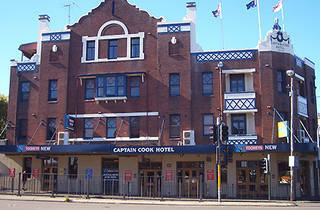 Here is where weekly gigs take place – not to mention one sneaky secret set from Green Day earlier this year. If sitting shoulder-to-shoulder with your buds at the bar and downing a summery Stone and Wood Pacific ale, a schooner of Redback with lemon or a Young Henrys real ale is more your scene, then claim a spot in the front bar.